UPDATE: In September 2015, Drax announced that they were pulling out of this project which therefore now seems unlikely to go ahead. 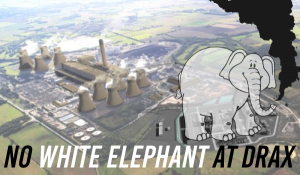 The White Rose Project by Drax, Alstom and BOC is a new coal power station (possibly to be co-fired with biomass) next to Drax’s existing coal and biomass power station, for which a planning application has already been submitted. The White Rose plant would be capable of capturing carbon but it could technically be run more efficiently and cheaply as a conventional coal power plant without any CCS and it would be flexible to burn coal or wood pellets. The planning application for the White Rose plant is separate to one submitted by National Grid for a CO2 pipeline, although the pipeline application will have an impact on whether the power station could be consented as a CCS plant. The White Rose project is one of just two ‘preferred bidders’ for a £900 million capital grant from DECC and the developers have already received £50 million from DECC for a feasibility study. DECC also expects the project to attract a Green Investment Bank loan. If the plant was built and consistently run with CCS, it would be eligible for annual subsidies (Contract for Difference) and for up to €300 million from the European Commission. However, there is no guarantee that the power station would operate with consistent, maximum CO2 capture or indeed with carbon capture at all. The plant would be automatically exempt from any limits on carbon emissions (and thus any requirement to capture carbon) for a period of three years. After three years, they could legally operate by either capturing just half the carbon, or by co-firing up to 50% wood pellets or any combination thereof. No other country in the world is investing in a scheme like the White Rose project. The technology for capturing carbon this way has already been tested and shown to be too expensive and inefficient to be commercially viable. Only a technological breakthrough could change this situation. Major public funding for a technology which two large energy firms have tested and dismissed as commercially unviable will not make CCS any more commercially viable; it will merely increase the demand for coal and potentially for wood pellets, as well as increasing CO2 emissions from coal mining, from logging and forest degradation (if wood pellets are co-fired) and from the new power plant’s smokestack since, at the very most, only 90% of CO2 can be captured, with no guarantee of any being captured at all.